Arsenal manager Arsene Wenger says midfielder Aaron Ramsey will return to the squad for Sunday's Premier League match against Everton at Goodison Park. The 23-year-old Wales international scored 13 goals in 27 games before suffering a thigh injury in the 3-1 victory at West Ham on Boxing Day. 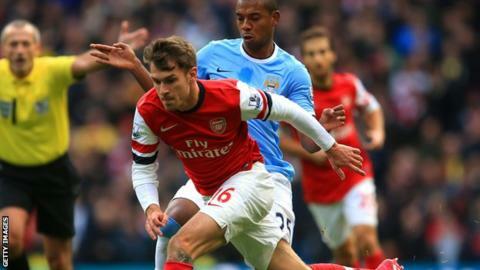 "Having someone like Ramsey, who can help the team be successful, is very important," said Wenger. "He has worked very hard in training [but] what he lacks is competition." Ramsey, who signed a new five-year contract in March, returns as Arsenal's season enters a crucial stage. The fourth-placed Gunners are just four points ahead of Everton, who have a game in hand, and face Wigan Athletic in the FA Cup semi-final at Wembley on 12 April. After a 6-0 defeat at Chelsea and 2-2 home draw with Swansea, Wenger felt his team had "turned a corner" with the 1-1 draw with Manchester City at Emirates Stadium. Arsenal are seven points adrift of leaders Liverpool with six games left. Wenger said: "Every game becomes vital. We have a small percentage [chance of winning] the title, but we have to give everything to make it possible." Toffees boss Roberto Martinez, meanwhile, says his side have "earned the right" to challenge Arsenal for fourth place in the Premier League, and Champions League qualification. The Spaniard added: "There are 21 points to fight for. It's down to how many we can get." Martinez received a fitness boost of his own with the news wing-back Bryan Oviedo will return from a broken leg before the end of the season, and could still play at this summer's World Cup. The 24-year-old Costa Rica international suffered a double leg fracture during the 4-0 FA Cup fourth-round victory at Stevenage on 25 January. "The moment the injury happened, I thought the World Cup was out of the question but there is a chance," Martinez said. "He has a good opportunity to join the group in the final week of the season, which is an incredible recovery time."